A fresh coat of paint for the living room, a custom-made dream kitchen or a pergola in the garden – it is not only Germans who are reaching for their hammers, saws and paintbrushes. With countless TV programs, magazines and websites giving advice and handy hints, do-it-yourselfers can easily transform their own homes without paying the professionals. All over Europe, DIY enthusiasts are making the most of these opportunities. And the joy of being creative in the home is not at all limited to the younger generation. In fact, it is older people, in particular, who like the satisfaction of reaching for their hammers or power drills and decorating their own homes. Minimalism or elaborate decor, plain-painted walls or patterned wallpaper: no matter what the current trend, Europeans are interested. 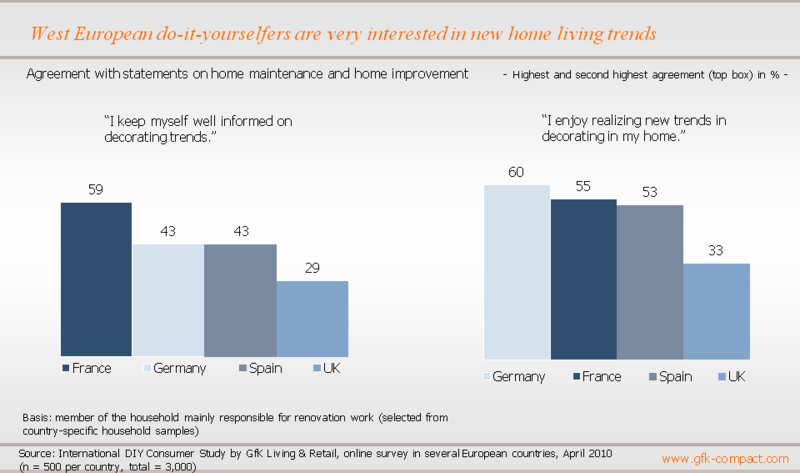 These are the findings of a survey of 500 respondents in each of several European countries, who bear the main responsibility for decorating their own homes, carried out by GfK Panel Services, Living und Retail department. Top of the league table for staying abreast of the latest trends are the French, more than half of whom keep themselves regularly posted on “le dernier cri”, or “last word”, in stylish living. Germans come in equal second with the Spanish, with 43% of survey correspondents in both these countries saying they thought it important to keep up with the latest trends in home decor. However, a home is not modernized by its residents simply keeping up with new ideas, and this is what the French, Spanish and Germans also believe. Consequently, they set about directly converting their knowledge into action, so that they can enjoy actually seeing new trends within and on their own four walls. The joy of decorating and creating is shared by at least 50% of those surveyed in each of these three countries, and in Germany, the figure is as high as 60%. Looking a little further north in Europe, a different picture emerges. The British are in a class by themselves in terms of both their interest in home decorating and furnishings and the will to try something new themselves, and in the UK, only about 30% of survey respondents expressed any enthusiasm at all. Once they have identified their favorite trend, do Europeans immediately head for the nearest DIY store? As if! Before buying anything at all, they want detailed information on products and prices. Only half the Europeans surveyed are tempted into impulse buying by special offers. Before embarking on any renovation, decoration or garden projects, the predominant majority study the brochures, leaflets and websites of home furnishing and DIY stores. Nearly 80% believe it is important to know in advance where to find the best offers. Almost as many go for an overview of the product range first before buying, and around 70% take their time to compare prices to make absolutely sure of having found a bargain. A similar proportion will obtain comprehensive advice before they ultimately visit the store offering the best price for the item they are after. However, anyone believing the price is the sole criterion will be very much mistaken. Ultimately, 77% are prepared to dig deeper into their pockets for quality products. Whether wallets are opened or remain firmly shut depends on a series of factors. Overall, it is evident that when it comes to renovation, buying is governed by pragmatism, rather than impulse. The majority of respondents – over 80% – state that a good price-quality level is one of the decisive arguments for buying the item in question. However, there is a yawning gap between levels of expectation and actual satisfaction and only around two thirds professed themselves to be satisfied with the actual price/performance ratio, which is 15% fewer than those saying this was an important factor in their purchasing decisions. Almost as many said that it was not only price, but also a wide variety of choice in the ranges that was important to them. 77% of survey respondents claimed they would not buy the first item spotted, but that they would select the product they wanted from a comprehensive range. However, this does not always appear to be the case and certainly here there is also a marked gap of almost 10% between aspirations and reality. The gap between satisfaction and the ideal is greater when it comes to the subject of comprehensible product information and competent staff, both of which are equally prominent sales arguments. Meaningful product information and products which are easy to find on the shelves are mentioned by more than 70% of respondents as important, and, at times when help is really needed, consumers are also hoping to encounter friendly and competent staff on hand to assist and advise. In all these points, there lies a chasm between the aspirations and the perceived reality of do-it-yourselfers. 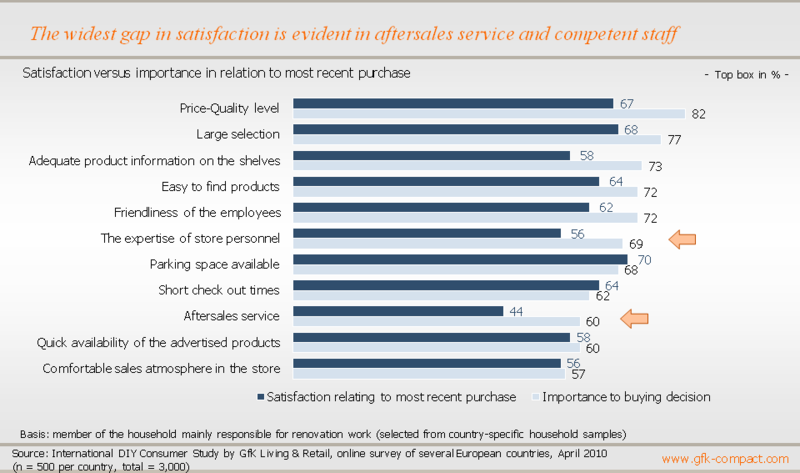 They believe there is an urgent need for improvement, above all in terms of product information: almost three quarters of those surveyed wanted more comprehensible information on the shelves, but less than 60% were happy with what they actually found in the stores. In the case of aftersales service, too, wishes frequently remain unfulfilled. Although at 60%, this customer requirement is not quite at the top of the wish list, only 44% of respondents said they were really satisfied with the aftersales service they actually received. Conversely, expectations in terms of parking space and waiting in line at cash tills were evidently adequately satisfied. Good lighting, pleasant music and subtle store decor all go towards creating a feeling of wellbeing on the sales floor and DIY stores have apparently done their homework in this respect. Equally so in the matter of product availability. These are important aspects, since they are the criteria which play the decisive role for around 60% of customers. Additional services, such as repairs, provision of professionals and equipment hire, are also ranked as important factors in determining customer satisfaction. And while these are not the only aspects that influence the decision to buy or not to buy, around one third of home renovators nevertheless rated them as important. Also in terms of the range of sustainable/green products and the availability of a wide spectrum of innovations, at least half of the DIY enthusiasts surveyed said that these factors were significant to their buying decisions. In these cases, the reality was evidently concomitant with the expectations. Use it or lose it: a saying taken very seriously by the over 50s generation with regard to renovation. After all, a new coat of paint in the home is not a subject of exclusive interest to the young. Around half the British, Germans and French involved in redecorating their own homes are over 50. This signifies that the older generation makes a considerable contribution to keeping the cash tills ringing in DIY and home furnishing stores. And since there is no sign of any reversal in current demographic trends, the importance of generation 50+ is likely to increase over the coming years. 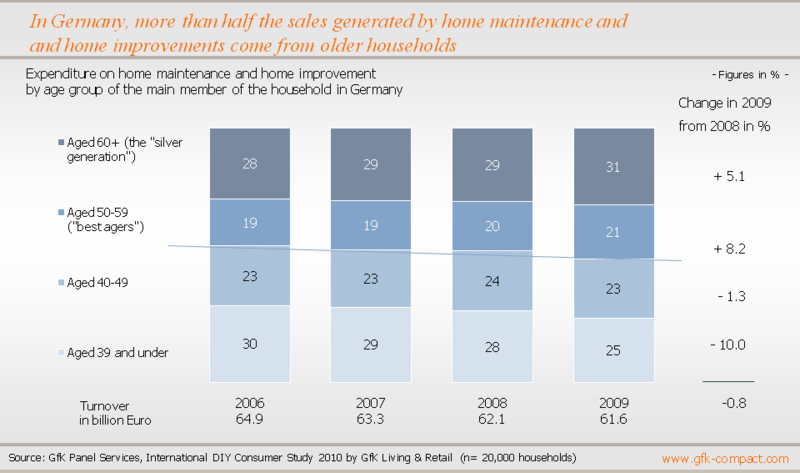 In Germany, it is a fact that for several years now that declining DIY sales have been somewhat offset by what are known as the 50+ “best agers” and members of the silver generation, aged 60 and over. Only they increased their expenditure in crisis year 2009 to raise their share of the total market by around 13%. Compared to younger generations, the over 50s also demonstrate a particularly high level of interest in renovating and modernizing. However, experience with using tools is an even more marked factor than interest alone. Probably on account of their age, 40% of older people believe themselves to be talented do-it-yourselfers, while among the under 30s, only around a quarter think they can rely on sufficient experience. Nevertheless, when it comes to decorating and making a home more attractive, the gap between the generations again narrows. Although older people are ahead on experience, the younger generation is catching up. At least a third of under 29s know how to enhance their own homes without embarking on major renovations. Of course, if conversion or modernization are on the agenda, a grandson may well have more experienced grandparents to call on for advice.